Interested in recent research on democratic organizations? The Sociological Quarterly has just published a special issue, organized by Joyce Rothschild, on “The Logic of A Co-Operative Economy and Democracy 2.0: Recovering the Possibilities for Autonomy, Creativity, Solidarity, and Common Purpose.” The articles cover findings, drawn from ethnographic research, interviews, and archival research, about how collectives engage in consensus-based decision making; how decentralization, storytelling, and communication help growing groups; how participatory practices obscure versus reveal inequality; how collectives redress gender inequality; how collectives dampen or harness emotions. Even better: All articles are free! Happy reading! The Marshall Project has an intriguing article on how often homicides are “cleared” – meaning that the police have closed the case by identifying a likely killer. 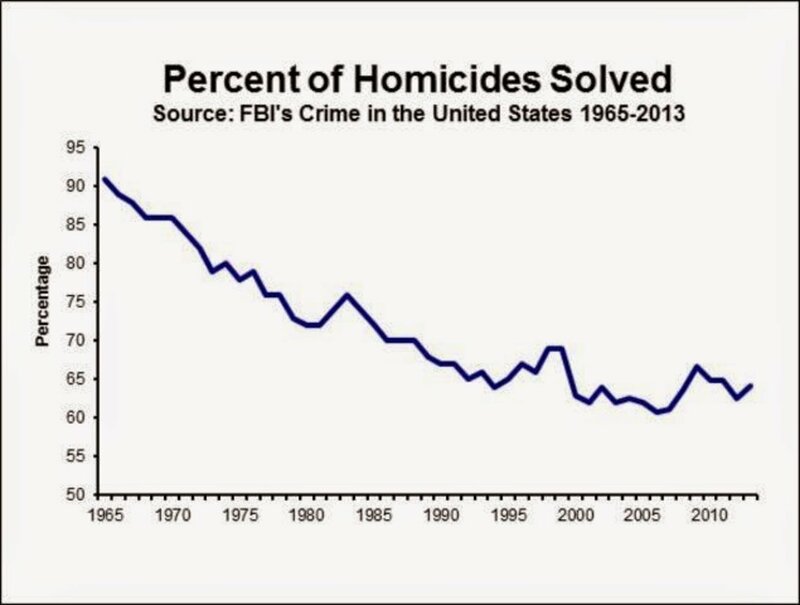 The big fact is that American murder clearance rates have gone down. As the chart above shows, homicide clearance has dropped by about a third. Why? The authors offer a few reasons. For example, gaps in clearance rates for Whites and Blacks have grown a little, explaining some of the decrease over time. Another reason is that police departments now often use DNA evidence and other tools that require testing, which leads to delays and dropped cases. There has also been a massive shift in resources from homicide investigation to drug enforcement. Here’s my guess: Before, there was a remarkably low barrier for getting a murder conviction. One reads cases of juries convicting people based on a single witness. In modern times, we simply have higher standards, which means that fewer cases will be cleared. where are all the anthropologists who do management research? Alex Stewart and Howard Aldrich have published a thought-provoking piece about anthropologists and ethnography in management research. In “Collaboration Between Management and Anthropology Researchers: Obstacles and Opportunities” in Academy of Management Perspectives, the authors discuss several ethnographies and the institutional environment of the business school. Yale is hosting a conference on $$$, which is open to the public, next Fri., Sept. 12th at Yale. The line-up is both impressive and exciting, not least of all because it involves our orgtheory crew plus beloved colleagues and dear orgtheory readers! Afternoon sessions: Yale Law School, 127 Wall Street, Room 127 (TBC). The financialization of the economy, as seen in the growing importance of financial markets and the shift from industrial to financial capitalism, stands out as one of the largest changes in the structure of the economy over the last half of the twentieth century (Krippner 2005, 2012; van der Swaan 2014). Indeed, van der Swaan’s (2014) review points to shifts in the structure of accumulation, the role of financialization in firms’ attention to shareholder value, changing individual and household approaches toward everyday life, and related changes in institutional structures. One important line of research focuses on the increasing concentration of profits in financial firms and its consequences for inequality due to its influence on top incomes, the labor share of income, and the distribution of income and profits across sectors (Tomaskovic-Devey and Lin 2011; Volscho and Kelly 2012; Kristal 2013). Even in firms which focus primarily on non-financial activities, financial divisions have become more important (Krippner 2012). While existing research has convincingly demonstrated the rise of financialization in the USA, fewer studies have examined these processes in other countries (e,g, Akkemik and Özen 2014, Godechot 2012). An important agenda remains to understand the extent to which the patterns and dynamics of financialization can be generalized or differ significantly across different types of capitalism, as well as how these have potentially reshaped global economic interdependencies.